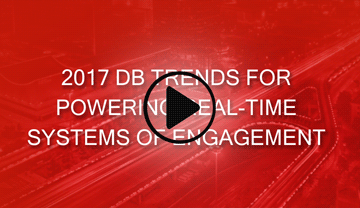 LEARN THE LATEST TRENDS FOR POWERING REAL-TIME SYSTEMS OF ENGAGEMENT. Join us as our guest speaker, Forrester Principal Analyst Noel Yuhanna, and Aerospike’s CTO and Co-founder, Brian Bulkowski, discuss the challenges companies face in powering real-time digital business applications and systems of engagement (SOEs). SOEs need to be fast and consistent, but traditional DB approaches, including RDBMS and 1st generation NoSQL solutions, can be complex, a challenge to maintain, and costly. The trend for 2017 and beyond is to simplify systems and traditional architecture while reducing vendors.